Prof. Hyunhyub Ko of Energy and Chemical Engineering (center) and his research team are posing for a portrait in their lab at UNIST. In the back row from left are Doo-Seung Um, Hochan Lee, Seongdong Lim, and Youngsu Lee. A team of Korean scientists−made up of scientists from Korea Institute of Science and Technology (KIST) and UNIST−has recently found a way to make building flexible pressure sensors easier—by mimicking the suction cups on octopus’s tentacles. SEM image of the surface of the smart adhesive pad. 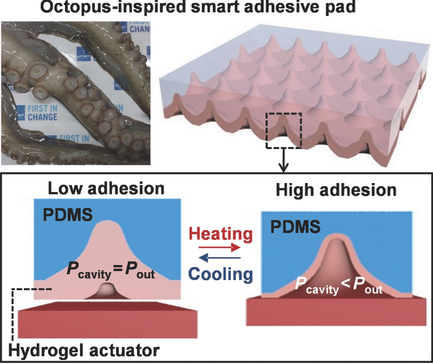 Hochan Lee, Doo-Seung Um, Youngsu Lee, Seongdong Lim, Hyung-jun Kim, and Hyunhyub Ko, “Octopus-Inspired Smart Adhesive Pads for Transfer Printing of Semiconducting Nanomembranes”, Advanced Materials, (2016).